In the midst of building FiftyAndFurthermore, I was starting to feel computer robotic so my husband and I took off to California’s renowned Napa valley for five days of sybaritic R&R. We were not disappointed. It was the perfect relaxing getaway. This time we chose to stay in one spot, Yountville, at The Vintage Inn at an intimate French country-style inn that blends 19th century romance with simple wine country elegance. The staff couldn’t be friendlier and in mid-winter, the inn has the feel of a cozy New England location without the need for snow boots and gloves, though a warm jacket is advised. The inn’s breakfast is varied and huge and starts with all the Mumm Brut Prestige Champagne that you want. Breakfast, though wonderful, put a damper on excessive wine tasting for the rest of the morning. Then, there’s a lovely tea service in the afternoon. I was delighted to find many of the guests were repeat visitors who came for a day or two just to get away and relax. Then I was off to the spa for soaking and relaxing before our next gastronomic experience. What is Napa without wine and good food? We were disappointed with our fist meal at a restaurant called Bricks, but I can’t say our rating is a fair one as it was one of the few restaurants open Christmas day. In my experience, most restaurants that cater to a Christmas day crowd don’t always show their best. To their credit though, when we asked if we could share the three course prix-fixe meal, they were most accommodating. We had reservations at Bouchon and Domain Chanson and although both are known to be very good, my husband had eaten at both, so we gave them up in favor of REDD’s and The French Laundry. Richard Reddington’s REDD’s is his first signature restaurant, the result of years of training with the world’s most renowned chefs. REDD’s cousin is a lovely mélange of contemporary American, or as Richard likes to describe it, “Napa Valley Food.” Casual, competent and good for light fare or a more hearty meal. I selected a seared scallop appetizer as my main meal and it remains memorable. I forget what fish my husband had, but it and his pear and fig salad were delectable. Paul, our waiter, was an experienced professional and I remembered what it was like to be served by someone who was friendly, competent, helpful with recommendations and who didn’t have to be my instant best friend. What a surprise pleasure that added to the perfection of a really good casual meal. Dining Style: Fine Dining. Although dinner is billed as 9 courses, I actually counted 12. The French Laundry is a member of Relais & Chateaux with the reknowned chef Thomas Keller. And of course it‘s pretty fabulous. I think everyone who can afford what can easily become a four digit bill for two, should have the experience at least once. It’s memorable. But for me, at my petite frame, I was glad it was our last meal in Napa as I couldn’t eat anther bite for almost four days… Not so my husband, who did fine in San Francisco, on the flight home and upon arrival in Washington, DC. My R&R had truly kicked in though. And I continued to sleep and unwind for at least another two days. 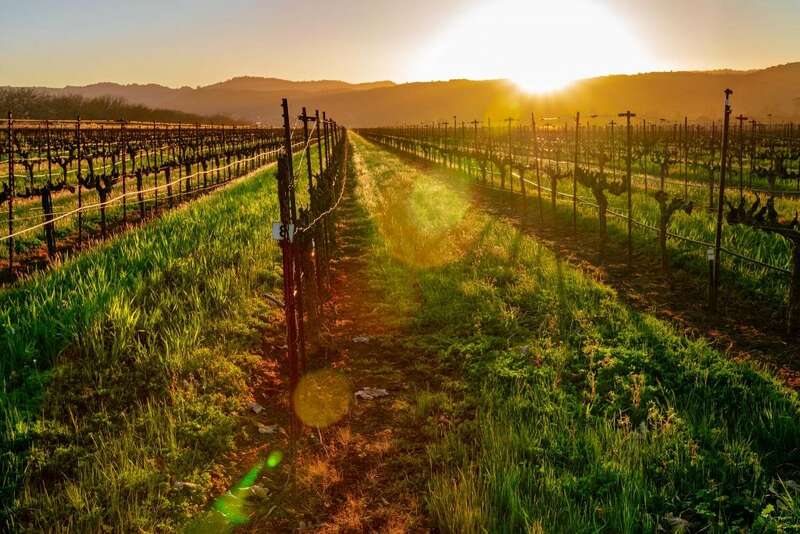 Napa is one of those perfect 4 -5 day getaways that really enhance the senses. In spite of time in bed, rest, sensuality, and too much food, we did manage to visit several small vineyards, selecting two smaller ones: Port type producer Praeger and ZD and found a wine or two to remember. I’ve got the glasses at home to remind me in case my memory misses a beat.